What are the reasons for the proposals? Profession improvements and updates generate positive buzz throughout the gaming community universe and game news, and indirectly contribute to sales. Think the general consensus from GW1 Vets is that they loved the way Professions were done in that game. Particularly the build options and flexibility to make what you wanted to play. To help create better "balance" between professions. To help speed up and smoothen the process of updating professions and creating new things for profession. 2 Reassign decent trait effects to weapon, healing, utility and elite skills instead. 1 example from this thread… https://en-forum.guildwars2.com/discussion/64920/weapon-and-build-diversity “Weapon Recharge Reduction Traits... "Remove the weapon cooldown reduction traits and make the 20% reduced skill recharge as the standard/baseline numbers. This will allow for more build diversity because players will not feel forced into trait lines just to improve weapon recharge reduction.”... My best suggestion would be to make the lower recharge times as a standard change AND add in whatever “cool” or unique effects to all Profession weapon skills, healing skills, utility skills and elite skills. 5 Add in new themed “Elite Spec” style weapons and Slot Skills REGULARLY, AND INDEPENDENT from Xpacs. https://en-forum.guildwars2.com/discussion/21472/missing-weapon-sets-for-professions-and-some-suggestions. I would even strongly consider making and selling “E-Spec” packs for cash, not on the gemstore, so more resources are available to update the game like all players really want. Also, untie weapon use to an Elite Spec and let players use whatever weapon they want or need. And we can obviously keep the restrictions of limiting builds to 1 E-Spec and their special slot skills at a time, just lock out other E-Spec slot skills until a player wants to change their E-Spec. GW2 Path of Fire was released on September 22, 2017, and Ranger daggers still only have a niche use in pve… https://en-forum.guildwars2.com/discussion/568/daggers-need-redo-and-backstab. 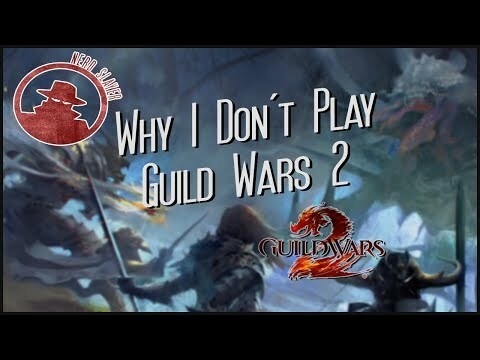 Roam around in wvw and try getting into fights while using Reaper GS, and any competent player will pick you apart more often than not… hence the thoughts behind these… https://en-forum.guildwars2.com/discussion/58958/eye-on-necro-ideas. *And just remember what Jon P. said “Jon P: yes, it’s probably the easiest one to get there. But only one in a million people have reached the level of a warrior that really sets them apart.”… True diversity and fun comes from offering unique roles to play and unique skills, NOT creating vastly different character mechanics and skill resources. Even if all professions just used cool downs, instead of whatever resource mechanics, each profession would still be unique. 9 Add in more gear sets more frequently. It’s good for players and good for the economy. Jeweler 500 with Ascended Trinket crafting. Ending here... If I were tasked with setting the main focus of future development, it would be paid PvE mini-xpacs, paid E-Spec packs and ongoing WvW updates https://en-forum.guildwars2.com/discussion/62658/alliance-design-that-stops-the-qq (because GW2 WvW still has potential and there is a market for RvR). I would also want one of the primary goals of the game to ensure that players are having a lot of fun playing any Profession. That would include having great skills to use in any mode, offering a lot of build and role options and also removing as many annoyances from combat and profession designs as possible. 1. F1 Fire Attunement toggle- Attune to fire and gain a X% chance to cause AoE Fire burst with any weapon attack. 2. F2 Water Attunement toggle- Attune to water and gain a X% chance to heal self with any weapon attack. 3. F3 Air Attunement toggle- Attune to air and gain a X% reduction to weapon swap cooldowns and gain swiftness. 4. F4 Earth Attunement toggle- Attune to earth and gain a X% reduction to Direct Damage. Alternate Attunement ideas… Summon unique Elemental pets that have various roles and skills. Only 1 pet can be active at any time. These pets have a health bar. *Get rid of the clone spam/summoning design on skills, and change “F” Skill functions. 2. F2 Cry of Frustration toggle- Gain a X% chance to cause Confusion with any weapon attack. 3. F3 Diversion toggle- Gain a X% chance to remove a boon on an enemy with any weapon attack. 4. F4 Distortion toggle- Gain a X% chance to gain Distortion while attacking with any weapon. Alternate F skill ideas… “F” skills become toggles that summon illusionary humanoids (not character duplicates). Only 2 illusionary humanoids can be active at any time. These don’t “blow up”, they fight and have health bars. 3. F3- Unique NON-HEAL SUPPORT “pet” that attacks opponents and provides non-heal buffs. • Get rid of Life Force resources. • ALL Shroud Ability mechanics become STANCES gated by a Recharge Timer. Shroud skills are maintained until downed, death or by manually exiting. Shroud is NOT a second health bar. Weapon Skill slots are replaced by Shroud Skills. Slot Skills ARE STILL USABLE. • Ranger needs better team based builds and roles, and some reworks. • All weapon and Slot Skills go on Recharge Timers. Weapons do not use Energy anymore. Slot Skills use Energy that automatically refills (like Thief Initiative). *Some weapon will be CORE themed weapon add-ons. Some weapons will be CURRENT E-Spec themed add-ons. Some weapons will be NEW add-ons with, or without, E-Spec Slot Skills. Some weapons will be REWORKS of current weapons (need to do more research on weapon across professions for rework ideas)… So I will either mark weapons with CORE ADD-ON, CURRENT ADD-ON, NEW or REWORK. *As per usual, each #1 skill has 3 total skills combined. *Weapons are released in full sets of 7 skills (three #1 skills plus 4 other slots), made up of (obviously) 1 two-handed weapon OR 1 main hand and 1 off-hand themed SET where possible. • Longbow (7)- NEW- Hybrid ranged AoE damage and heal spec. Fires canisters attached to arrows that have different damage and heal support effects. *Going to research GW1 wiki to toss in some Legend ideas to think about. *Warrior obviously has the most CORE weapons, so I would suggest the following… Do some weapon reworks (have some ideas below). Add in some ALTERNATIVE weapon version for Warriors to choose from when equipping a weapon.. So like having a CORE Greatsword option and a NEW Greatsword option to select, and so on... This seems like an appropriate bonus for Warrior, that also sets them apart as the GW2 “weapon masters”, while giving all professions access to every weapon. A lot of good ideas. Although I don't see how removing traits would be a good thing. It would remove a lot in build diversity and this is pretty bad. Now, I would remove all traits that do only provide modifiers. They are just boring and not fun. Traits that alter skills or dodge are great by design. But it might be over complicated to balance then. Within 6 years and 7 months there have been 2 new sets of Elite Specs per profession and 1 new class (Rev). An Elite Spec consists of 1 weapon type. 5 Slot Skills. 12 Traits. It adds more dev time and resources to create Traits, balance Traits over time and to do Skill Splits over time... The proposal takes current Trait effects and ADDS them to skills. Removing the need to produce, and balance in the future, 108 more Trait effects across 9 new profession Elite Specs leaves more dev time and resources to make NEW weapons and NEW Slot Skills, and to improve upon weapons and Slot Skills... The proposal is about adding in MORE Elite Spec weapons and Slot Skills more frequently, and that's where true "build diversity" comes from. So would you be opposed to, let's say, the devs being able to give each profession 2 new Elite Specs, with 2 new weapons and 2 new sets of Slot Skills per year, as opposed to the current Elite Spec design that is released every few years and tied to an Xpac? Because ya know, instead of having the devs make 9 new weapon skills, 45 Slot Skills and 108 Traits every few years, I don't think many players would complain if they had more unique Elite Spec weapons and Slot Skills more often... Among other potential improvements the team could devote the time and resources to when they do not have to niggle about traits and skill splits. Remove thiefs kit from other classes. Lol yeah during powercreep time alot of thiefs identity ended up spread through various classes,just another way arenanet shows thief love. Sorry, I have seen no such "consensus." I don't disagree that those who like the GW1 system absolutely loved it and I'm not against ANet considering that affection in their future plans. But please try to avoid speaking for others: quite a lot of people thought that GW1 was great for mathematical diversity and terrible for actual valuable builds. In particular, gear & stats management was horrid. It would be more fair to say, "lots of GW1 Vets have asked for something like how professions were handled in the older game..." and go on from there. I can agree with you, and that's reasonable. I never played GW1, but comments that I have read over the years point to players liking the profession system there, as opposed to here. This game reviewer goes over a lot of topics, with comparisons between GW1 and GW2, and the love of the skill system in GW1 is something I've seen in comments through the years. If you do watch the video then please let me know what you feel about his comments on professions in GW1. Sure, people who feel something is missing are more likely to complain about its absence; those that prefer the status quo are unlikely to take the time to comment. I'm unlikely to watch a "why I don't play" video (and to be fair: I'm unlikely to watch a "why I do play" video either), mostly because so few include any commentary interesting to me, that couldn't be written down in a few sentences. Most people who wax enthusiastic about GW1 builds focus on the diversity, while glossing over the appalling mechanics for weapons stats, the high fraction of duplicative or useless combinations, etc. The one thing that GW1 has that is far superior is templates. I confess that I was reluctant to trust ANet on GW2 builds: forced skills by weapon choice, a mandatory heal, and only three elective skills... that all sounded worse to me. Except ... in practice, I've found that the actual choices I make in this game are more meaningful and distinctive. There are all sorts of engaging ways to play engie in GW2, but fewer ways to play ritualist successfully in GW1. I understand, and generally don't watch those types of videos either. Was posted a while back by someone in the spvp section and had some interesting points and info. The game still has new builds being discovered today. There were over 1000 skills and a dual class system that allowed combining professions.